MANILA, Philippines - The official results, list of passers, top examinees and other important announcements for March 2018 Civil Service Exam - Pen and Paper Test (CSE-PPT) both for professional and subprofessional levels are released by the Civil Service Commission (CSC) within sixty (60) days after the eligibility examinations. 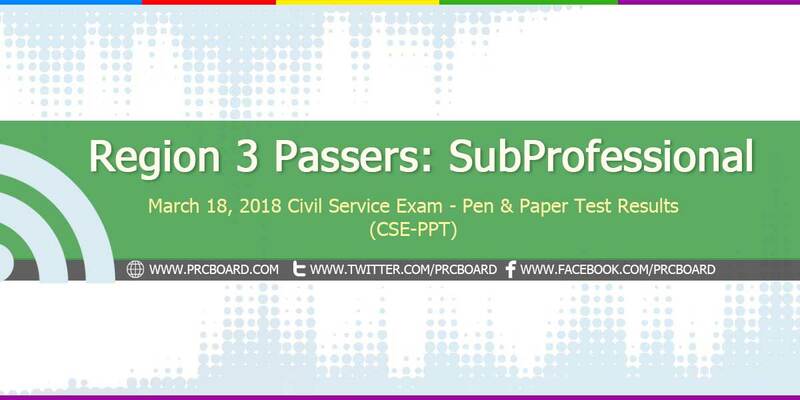 Below is the complete list of passers for March 2018 CSE-PPT Subprofessional Level in Region 3 (Central Luzon). i claim it ! pasado ako. in Jesus name. Pumasa ako. Thankyou lord for all the blessings. Mama mary slamat po at ginuide nyo po ako. maraming slamat din po at naka pasa na po ako. Lord kayo na po bahala po bukas saken sa resulta. kailan po ipopost ung result? Mahabang panahon ipinagpanata ko po ito sayo Ama, alam ko ipapasa mo ko. Amen. lalabas pa po ba yung results? kabadong-kabado na po ako hehe. bakit wala pa po result? Please. Ako namn na sana..